The Temperance card is a major player in the Major Arcana and I’m going to tell you why. Temperance is about balance and therefore it relates to all of your relationships. When this card turns up in your spread you can be sure that your friendships, family, romantic partnerships, and work partnerships all need your attention. The card features a winged angel that is actually a hermaphrodite, which indicates a balance between the genders. The angel has one of her feet on dry land, representing the physical world while her other foot is in the water, representing the subconscious. Her physical stance displays the need to “test the waters” so to speak, before charging ahead into the unknown. She holds two cups in her hands that she uses to mix cold and hot water. Both of these cups represent the subconscious and super-conscious. In her hands she holds two cups which she uses to mix water. The cups represent the sub- and super-conscious minds. The water flows between them from the lower cup to the higher one, signifying the rising of consciousness from a lower plane to a higher one. The temperate individual finds balance in life by avoiding extremes and proceeding through life making level-headed decisions. Temperance indicates that you are finally learning to bring balance, patience and moderation to your busy life. This is good news! You’ve been able to avoiding extremes, maintaining a strong sense of calm in your life. You have learned to stay relaxed in stressful situations and even if you are feeling anxious, you handle it with such aplomb that no one even notices. You have learned to not sweat over the small stuff and you know how to put things into perspective when life gets a bit of control. This new-found respect for balance is going to help you to achieve fulfilment in your life. But it gets even better! The Temperance card indicates that you have a long-term vision of what you want to achieve. Instead of rushing things and making mistakes, you’re taking your time to ensure the best of all possible outcomes. This shows that you are learning from your previous mistakes in the past and your life journey is becoming easier. The presence of this card in your Tarot spread shows that you are at peace and content with where you are in life. You are judging yourself less and going with the flow of the energy within you and all around you. Your intuition is guiding you and you’re listening it as you’ve learned to trust yourself more. With regards to your relationship. The appearance of Temperance in your spread indicates your ability to adapt, coordinate and essentially “temper” external influences. You work in harmony with your friends, lovers and colleagues and the synergy leave you breathless. You’re able to manage your time like a pro as well, which means now is the time to get things done. You must be feeling inspired! When Temperance appears it means that now is the time for self-evaluation. You need to take the time to re-evaluate your life. Here’s what’s going on: while you’ve managed to achieve a greater balance in your life, you’re still seeking for a higher meaning or the purpose of your life. During this transition you’re going to feel a clash, an inner battle if you will, between the old you and the new you. Trust me, it’s going to be a showdown, but in the end it’s all worth it. Looking inward is going to transform you for the better and we both know you’re looking for a change. 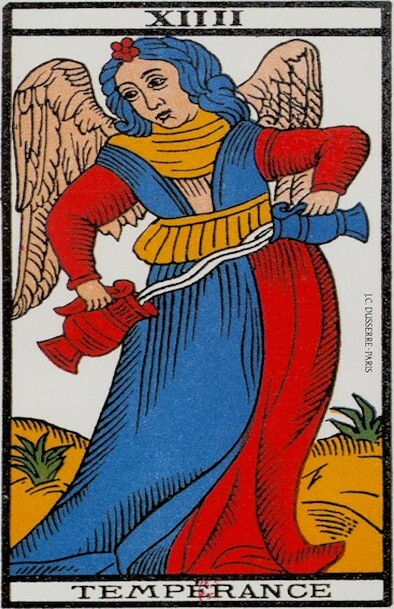 The past is an excellent position for the temperance card because it means you’ve already got a solid history of engaging the actions that Temperance represents. You’ve already been through intense adversity and you’ve learned through your mistakes. You may already display a calm and patient nature. But you can never have enough patience, right? Temperance in the present might represent some turbulence in your current situation where you are struggling to find the balance you need. Try to remember that the card is a good omen. Its presence is a reassurance at you have the energy and the ambition to tackle your troubles head-on. It is also a reminder that it’s time to tie up any loose ends that might be lingering from the past – a kind of spring cleaning of the soul that will help you go forward more easily. Temperance is totally in her element in the future. Despite the trials and tribulations you have faced in the past, and/or the ones you’re presently dealing with, the card’s appearance in your future spot in the spread means that you will rise to every and any occasion in the future. Yes, it means that you’ll be facing some more problems, but that’s life, sweetheart. Through all of your experience, you’ve gained the strength, courage and patience to deal with whatever life throws your way. If your Tarot spread features a reversed Temperance card this reflects the fact you’re your life is out of balance. There may be conflict or an excess of negativity and all of this creates stress and tension in your life. It can also be an indication that if you choose a certain path you will cause an imbalance in your life’s path. Be wary of hurried actions as they will only lead to further problems. If the Temperance Tarot keeps reappearing in your readings the universe may be trying to tell you something. Maybe it’s the right time to see an expert Tarot reading in order to determine why this particular card comes back to you time and time again. Get in touch! This entry was posted in Cards and Divination, Tarot and tagged temperance card, temperance tarot on November 18, 2014 by Mirella.